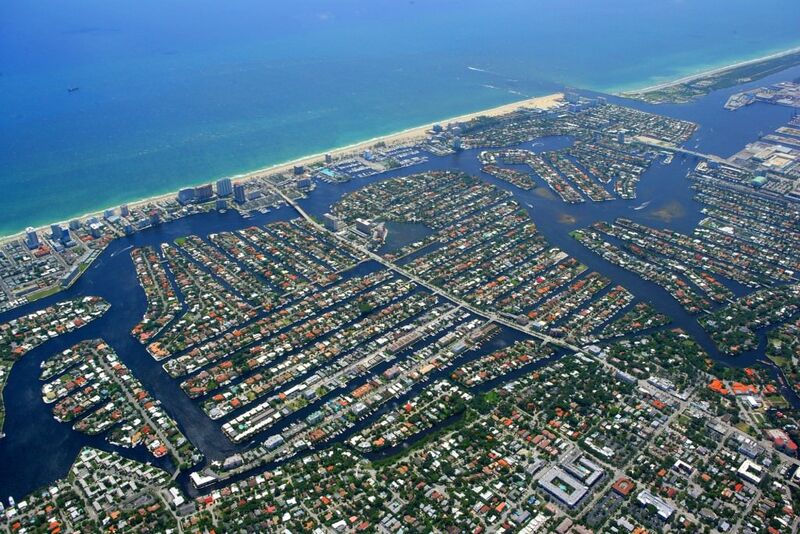 Fort Lauderdale is known for its extensive network of canals, with over 165 miles of waterways within the city limits. Among this network is a wide range of waterfront condominiums, townhomes and single family homes that are located on bays, lakes, canals, rivers or directly on the Intracoastal Waterway. Over 72 artificial reefs sit just off the coast of the city, offering year-round fun for fishermen and free-divers while areas like Lake Santa Barbara or the water ski zone on the Middle River provide a different kind of adventure for boaters. When buying waterfront property, it’s obvious but important to point out that location determines value for resale and utility. The most desirable locations for dockage tend to be mid-canal properties as they offer clean and calm water. Point lots are highly sought after as they provide unparalleled wide water views and sometimes allow dockage for multiple vessels on quiet side canals. Proximity to Port Everglades and Hillsboro Inlet is also a big factor when considering boating lifestyle and property value. For example, if you’re looking for quick direct ocean access near downtown, neighborhoods along the New River and Las Olas Boulevard would be very convenient options. Beachfront homes are not suitable for those looking to keep their boats at home, however some Hillsboro oceanfront properties extend across A1A to provide Intracoastal dockage. Waterfront does not necessarily mean ocean-accessible for all vessels. Some canal homes in Fort Lauderdale are located in areas that have fixed bridges, so consideration for the height of your vessel and bridge clearance height is important. Canal widths and depths vary significantly by neighborhood within the city. Contact a waterfront specialist to make sure water depth or low tide will not affect your boat. Wake Zone vs. No Wake Zone: Some homes directly on the Intracoastal are in a wake zone unsuitable for docking larger vessels. Lifts for smaller boats are appropriate in these areas. The waterfront width of a property is important but you’ll also want to verify required set-back widths for docking a vessel, which can be different for every lot. City and county zoning laws apply to boats too and can restrict the size and type of boat you are allowed to dock at your property. It is essential that seawalls be inspected by a licensed contractor prior to closing. Comprehensive inspections include dock and pilings and will catch any bowing, deterioration, cracks or holes hidden from sight.